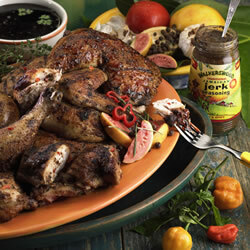 The most popular method of Jamaican cooking is “jerking,” a traditional method of rubbing meats and vegetables with a spicy seasoning paste (Jerk Seasoning) and then cooking over a slow wood fire with the meats spread across pimento / all spice sticks which add the smokey intrigue of the traditional Jerk Pit. Think you know your Veggies? 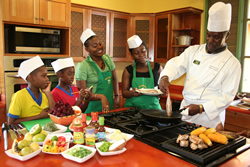 Well think again, WALKERSWOOD offers Caribbean vegetables which might retain an air of mystery in North America and the UK, but are an absolute must in Jamaica. WALEKRSWOOD (CANNED) ACKEE is a Caribbean fruit that is actually enjoyed as a savoury vegetable. It has a delicate flavor and the texture of avocado. It is delicious when sautéed with onions, peppers and tomatoes – a great vegetarian dish. Ackee cooked in the same manner with the addition of Salted cod fish is Jamaica’s national dish. WALKERSWOOD (CANNED) CALLALOO is a green leaf vegetable, rather like spinach. As well as a nutritious side dish it is delicious when used as a stuffing for fish or chicken. Mix it in with rice for a more flavoursome rice dish.